PanARMENIAN.Net - The Russian Ministry of Defense announced on Wednesday, September 5 that their Air Force carried out several airstrikes in Syria’s northwestern region, Al-Masdar News reports. Using their Sukhoi jets, the Russian Air Force unleashed a flurry of airstrikes over over the militant positions near the Turkish border on Tuesday. Among the many targets of the Russian Air Force on Tuesday was an anti-aircraft missile factory the belonged to the militant rebels in the Idlib province. The Russian Ministry of Defense said that their Air Force managed to destroy the anti-aircraft missile factory, along with a weapons depot that belong to the militant rebels in this area. Furthermore, the Russian Ministry of Defense said that their Air Force destroyed a couple of bases belonging to the militant rebels near the Turkish border. 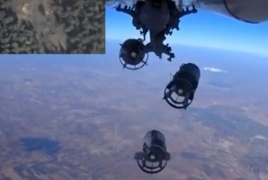 With a major offense of brewing in northwestern Syria, the Russian Air Force has intensified their airstrikes over the region in order to weaken the jihadist resolve before the Syrian army launches their long awaited assault.